A router needs a stable platform for intricate cuts and precise edging. That’s where the router tables come in handy. It turns your router into an amazing multi-tool and adds a new dimension. But a router won’t be that effective if you don’t have a proper router table. You can settle for homemade tables, but then these require a high level of skill to build, something that you may not have. 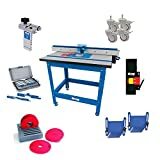 Instead of working your head off, you can shell a few dollars and get yourself a nice pre-made router table. However, care should be taken so you get a table that performs as advertised. But where do you start looking? 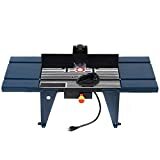 Well, we’ve got a recommendation of the best router tables that will take your woodworking experience to a new level. This versatile router table fits a variety of routers. It has a large, aluminum work surface and a tall fence to handle large stocks with ease. The table has adjustable face plates made of MDF, a feature that gives better support and smooth operation. It accepts routers up to 3.5 inches in diameter. The table has a lockout security key, which keeps off unauthorized use. Some essentials are included to make it easy to route curved work pieces. This is a cabinet-style router table designed for versatility and precision. A tall fence and adjustable face plates accommodate most stocks with ease. The table has a rigid aluminum construction that stays true and flat for improved accuracy. The cabinet underneath does a good job in dust collection. This table has an adjustable clear guard so you have a good view of the piece you are working on. Bosch RA1171 is compatible with routers up to 3-5/8 inches. 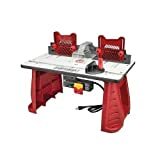 This router table has an adjustable working surface for great convenience. It has an extension that gives an additional 7.8 inches of working area. The main table is made of aluminum while the extension wings are made of steel. This is a good combination for providing long-lasting use. Goplus router table is a good option for both newbies and pros. It is compatible with routers that have a base plate size of up to 6 inches. 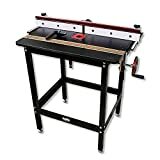 Craftsman router table has a laminate top that gives a smooth working area. The cutting height can be adjusted for comfort and great convenience. The table comes with 3 rings to fit a wide range of bits for added versatility. It is capable of making mitered cuts of 0 to 60 degrees in either direction. The fence is adjustable to give good bit clearance. The top rests on lightweight yet sturdy legs made of molded plastic. This table is an inexpensive option for transitioning to the next level of woodworking. 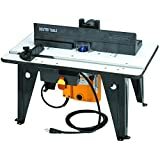 Skil RAS900 is a reliable router table with a good storage solution. It comes with integrated storage containers to hold accessories. The table has a laminated MDF top that gives a smooth working area. A quick clamp system saves time and keeps the work piece from shifting. The table has a bit height gauge, which makes bit setup easy and improves cutting precision. There’s a quick-release mechanism that lets you mount or remove the router in seconds. The legs can be folded for easy storage. This router table comes pre-assembled so minimal setup is required. This router table gives good mobility. The top rests on a heavy-gauge steel stand fitted with casters. The height of the stand is adjustable from 29 to 35 inches to match both short and tall users. The work surface is made of 1-inch thick MDF that lets the work piece slide smoothly. This table comes with three reducing rings to accommodate different router bit sizes. There’s an organizer tray that keeps the workplace neat and ensures accessories are within easy reach. 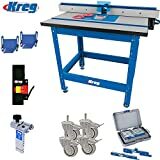 Kreg PRS2100 is a stable router table. The stability is achieved from a heavy-duty steel stand that widens towards the bottom. The feet of the stand are fitted with rubber to keep vibrations to a minimum. MDF is used for the top to give an easy glide surface. The table has a full-size router plate with 3 reducing rings, a feature that lets different router bits fit in securely. The sliding faces of the fence are move independently for increased support. A vacuum shroud is included to keep the work surface clean. This is a sturdy router powered by a 1.75hp plunge router. The top is made of composite MDF construction to dampen vibration and give a smooth work surface. The stand is made of rugged 19 gauge steel. It has mounting holes at the base to anchor on the ground for more stability. A depth scale is included for greater precision in bit replacement. The guard is made of plastic for easy viewing of the work piece. This router table makes miter cuts of 0 to 60 degrees. An electric quick-stop brake is included for additional safety and precision. This router table comes ready for use. The table includes an accessories kit that keeps everything organized. This router table has a T-fence that stays parallel. The top has a durable core material for long-lasting durability. It rests on a heavy-gauge steel stand for more stability. The legs can be adjusted from a height of 29 to 35 inches, which fits both tall and short users.